They’re getting ready to light the giant Christmas tree in Rockefeller Center. That means it’s time to review some of the most mind-blowing Christmas tree pics on the internet. Some of these are incredibly awesome and some are epic Charlie Brown fails. But they’re all eye-popping in one way or another. Nothing says Christmas quite like a tree shaped as a giant city-destroying monster. Am I right? This tree is both elegant and funny. The subtle blending of the winter wonderland snowman theme with the whimsy of the trapped elf makes this tree a winner. You’ve got to appreciate the guts of someone who would risk creating life-long, crippling phobias in children by styling creepy, present-eating foliage as Christmas decorations. This geeked out Christmas Tree lives in Madrid, Spain. The tree is actually electronically animated so you can watch Pac-Man get chased around by ghosts as you ponder the meaning of Christmas. There’s a whole sub-culture of Christmas Tree decorating that is about using your Christmas trimmings as an opportunity to show everyone how much you like something else. This Nightmare Before Christmas tree is all about letting people know that you’re still not over Halloween. 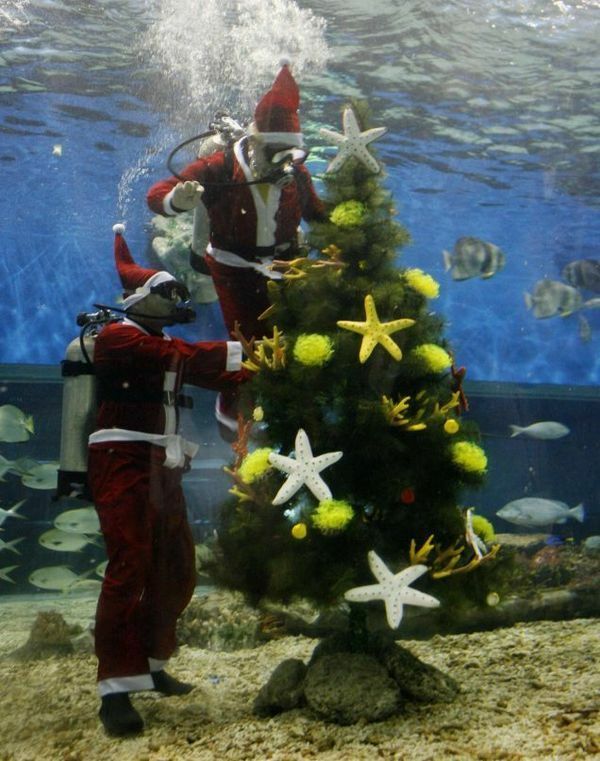 This tree at an ocean park in the Philippines proves that Santa not only visits all the good little boys and girls, he also visits good little boy and girl fish. This is probably the most epic Christmas Tree fail of all time. It’s not so much a tree as a spider plant. This tree is actually pretty cool. But it’s hard to get over the fact that it’s made entirely of green balls. No teenage boy lives in the house, I can guarantee that. Who would have guessed that if you combined an orange traffic cone with a blue and white strand of tinsel you could get this fabulous piece of Christmas tree art?